[F]ocusing on oppression can blind us to a greater truth: that China is in the midst of an unprecedented religious revival, involving hundreds of millions of people – best estimates put the figure at 300 million: 10 million Catholics, 20 million Muslims, 60 million Protestants, and 200 million followers of Buddhism or traditional religions in China. This doesn’t include the tens or even hundreds of millions of people who practice physical cultivation like Qigong or other forms of meditative-like practices. The precise figures are often debated, but even a casual visitor to China cannot miss the signs: new churches dotting the countryside, temples being rebuilt or massively expanded, and new government policies that encourage traditional values. Progress is not linear – churches are demolished, temples run for tourism, and debates about morality manipulated for political gain – but the overall direction is clear. Faith and values are returning to the center of a national discussion over how to organize Chinese life. If we take all this together, the most important conclusion is that religion, far from being an issue of fringe or esoteric interest, is back in the center of Chinese politics. This is the result of hundreds of millions of worshippers pushing for a place in society. And now, because they have not died out but instead proven to be an irreplaceable part of modern-day, the Communist Party has decided to try to coopt some of this new social force, creating opportunities but also growing tensions. For millennia, religion was the ballast that kept the Chinese state stable. For over a century, the state cast it overboard and Chinese society heaved to and fro, swinging from dictator-worship to unbridled capitalism. Now, religion is back but the question is if it will be a stabilizing force in society, or unmoored by counterproductive government policies, a loose cannon that crashes through the decks. Much more background from Ian Johnson in the China Zentrum. 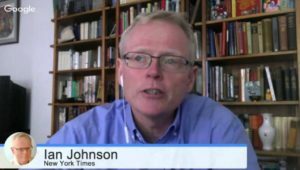 Are you looking for more recent stories by Ian Johnson? Do check out this list.